Clothes are our second skin and part of our identity. 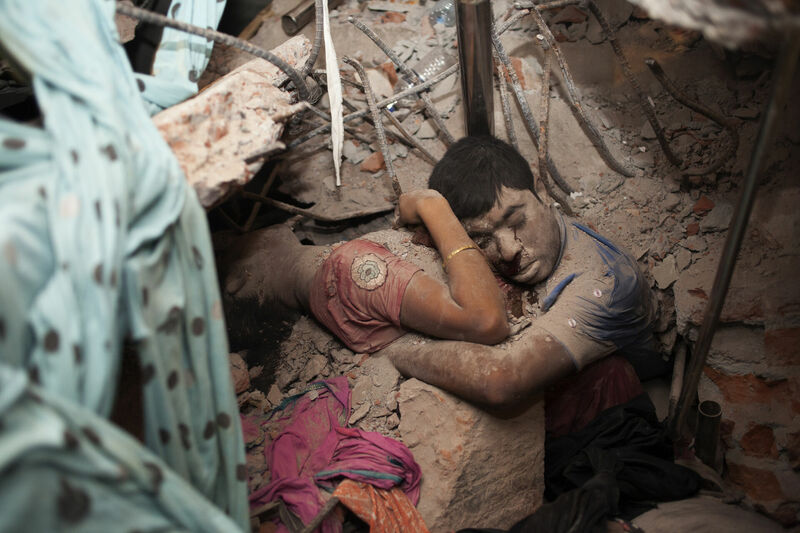 But the fashion industry is amongst the most polluting and inhumane industries in the world. A lot of good brands are transparently communicating their fairer production methods, others make efforts behind the scenes. Some larger retailers have planet-friendly product lines, others are greenwashing their overall business by juggling with terms as recycling, conscious and organic. So how, as a customer, do you find your way and differentiate between all the information? When you as a shopper read something about the unethical working conditions, or water scarcity, poisoned rivers and soil erosion due to the fashion industry in your favourite magazine or on tv. You become aware of the pollution and inhumane working conditions. 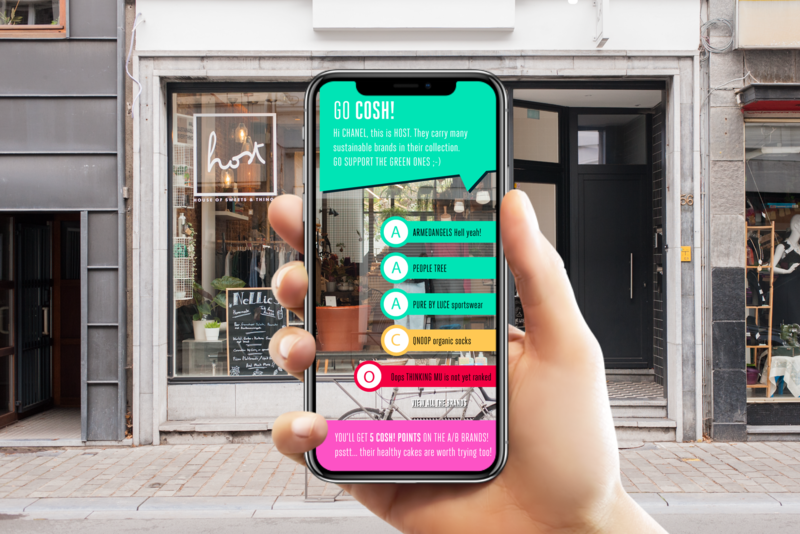 You pledge to make a change and you download the COSH app. 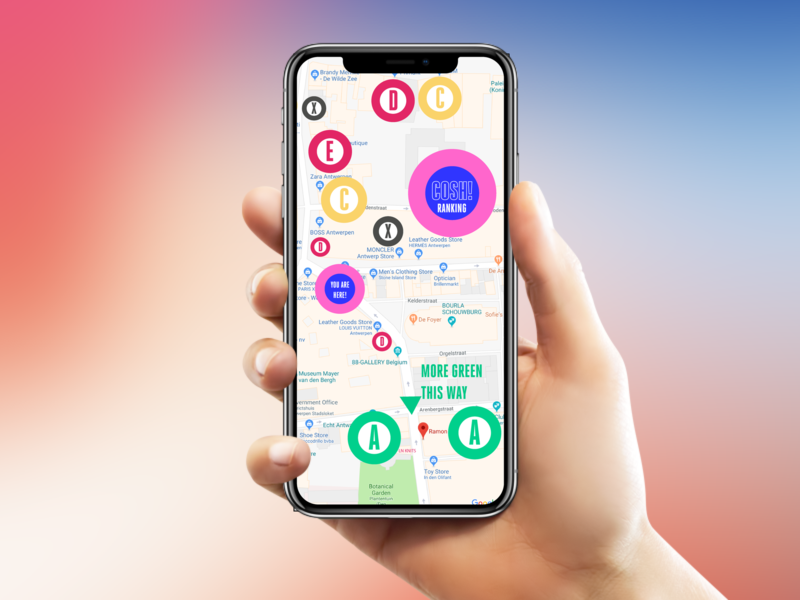 When you then go shopping, (we can alert you when we notice you are approaching the high streets), we can guide you real-time and location based to a more ethical and planet-friendly choice. We display our store ranking in a very minimal form, but when you click through, you can see where we derive our information from. When you hold up your phone in front of a store, you discover the good brands or product lines they are selling. This way you know which brands to look out for in a shop! In the future we will expand our COSH app to a multi-platform. The COSH plug-in will advise you on a more sustainable brand when shopping online. Convinced? Get started with COSH today!